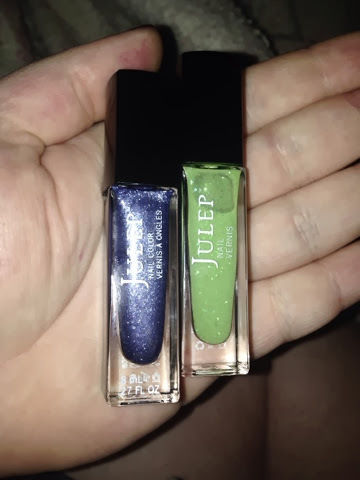 So again another review a friend and I painted our nails together and she used some colors from my big julep contest win . She loved all the green summer colors, she opted to paint one nail green for st pattys day. First colour is Tracy and the green is Sofia. then I had with the colours in the this post. 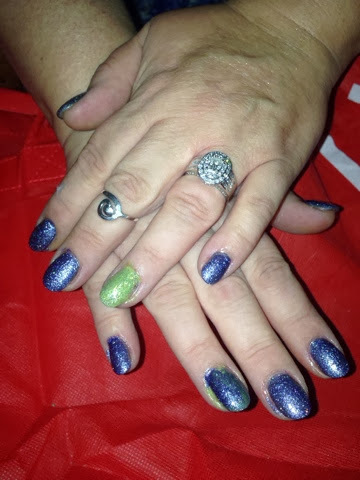 It went on smooth but required 2 coats, the colours she chose had sparkles in them. I have to say I'm pretty impressed it looks smooth and really nice paired with the polymer top coat it just looks amazing, I asked her what she would rate it and she said 10/10. If you like sparkly nail polish then I suggest grabbing these. Colours . The Tracy has a purple blue hue to it. Do you have lots of nail polish? Do you like to invite your friends over for nail polish party's?